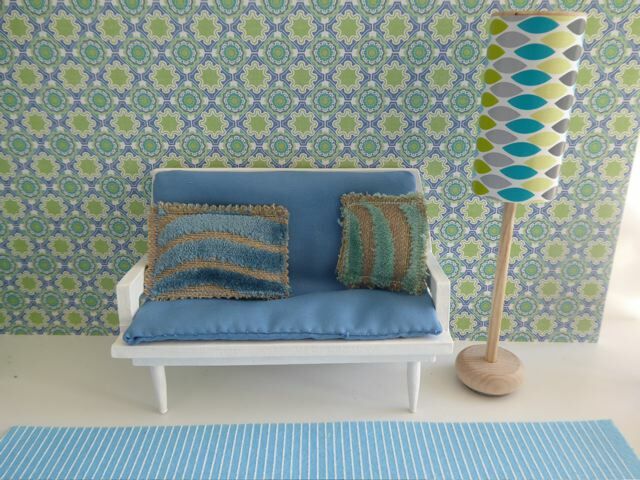 SOFA AND CHAIR: A terrifically stylish, hand-made duo with the tapering, spindle legs so fashionable during the 1950’s-1970’s. 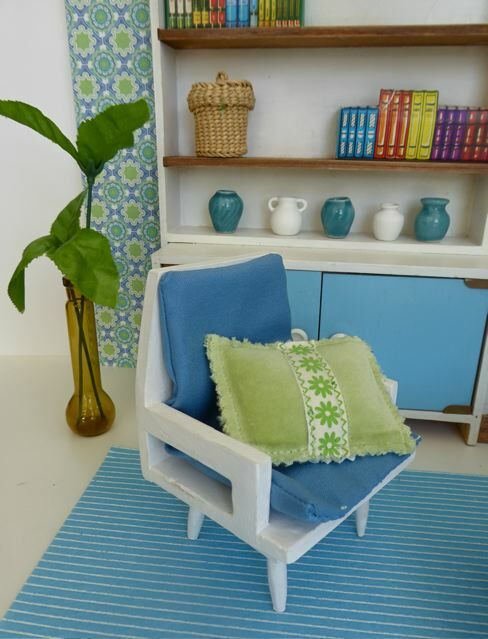 It has handmade, blue cotton upholstery plus three, handmade, velvet scatter cushions. SHELVING UNIT: More fantastic period details adorn this European-made piece. 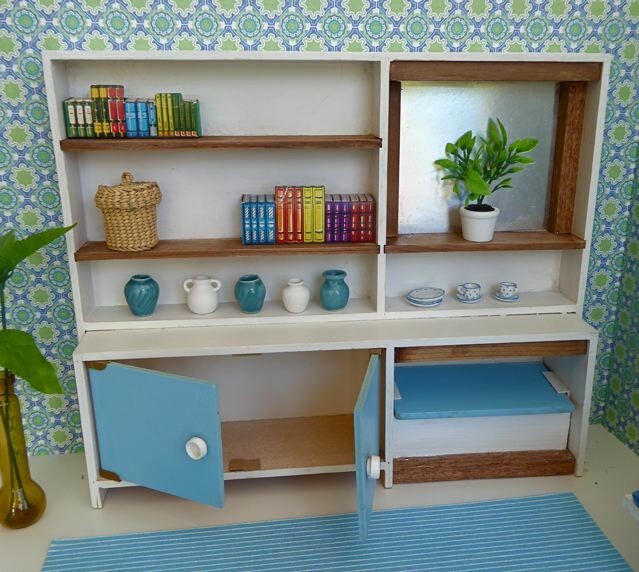 It features stained wood details and book fronts in cardboard. We have adorned it further with a potted plant, a lovely lidded basket and five ceramic vases. COFFEE TABLE: A pale wood coffee table from American manufacturer, Halls Lifetime Toys, set with a blue-dotted tea set. 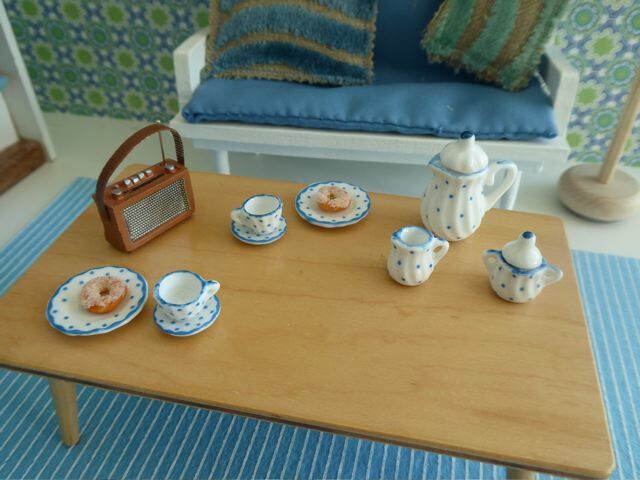 On the table sits tea-for-two, complete with doughnuts, while the rest of the tea set is displayed on the shelving unit – please see the close-up photos. And best of all, the little tan transistor radio comes with this set – it’s the perfect period detail! LAMP: A handmade, wooden, standard lamp with a lampshade covered in glossy, modern but retro-inspired wrapping paper. PLANT: Two verdant, leafy fronds sit in a tall glass vase. RUG: A piece of stiffened, printed (striped) felt. WALLS: Covered in modern wrapping paper. It has been mounted on two A3 pieces of 5mm thick foam board. Each piece of foam board measures 42 x 29.5cm or 11 5/8 x 16 3/8in. 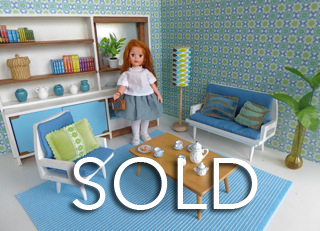 DOLL: Chosen from our selection of vintage dolls. Shown here, a Kripplebush Kids doll, made in the late 90’s. Price: £50.00 with her handmade , vintage skirt and blouse, but she is also available without these clothes in the DOLLS section of this webiste. Note that there are lots of other clothes available for this doll – please see the CLOTHING section of our website for an idea of what is available.